Nearly everyday, we see images of refugee children, some of whom have travelled by themselves to get away from their war torn countries in search of better lives. It is heart wrenching to see their deprivation. These are not the first children to travel through Europe as refugees. In the late 1930s, when Hitler’s Germany was coming to the pinnacle of its power, tens of thousands of Jewish children from Germany, and eventually Austria, Czechoslovakia, Poland, Hungary, and other countries left their homes to travel to England and further afield. 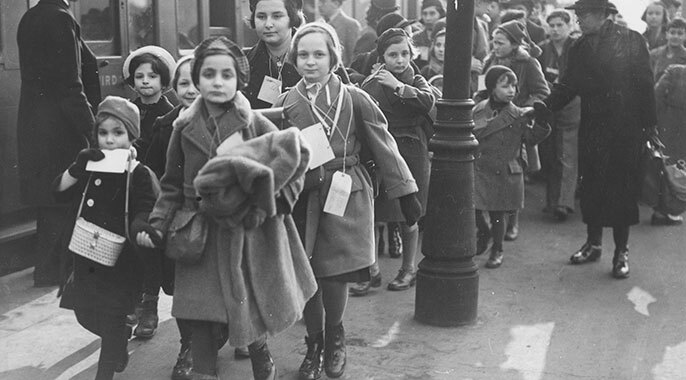 This mass movement of children became known as ‘Kindertransport’, ‘Kinder’ being the German word for children. On trains and boats, these children left behind siblings, parents, grandparents, friends, and the only way of life they had ever known for the relative safety in England and beyond. Typically, these children never saw any of their relatives again, as many were murdered by the Nazis during World War II. 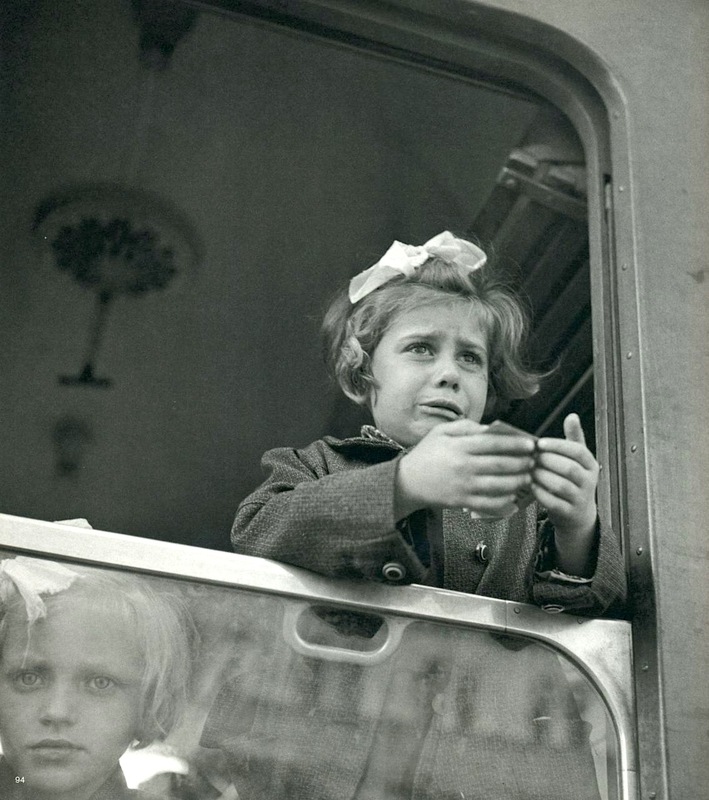 For the majority of these children, the parting at the train station in cities like Berlin or Prague was forever. It is estimated that 10,000 children were saved between December 1938 and August 1939, just prior to the outbreak of the war. 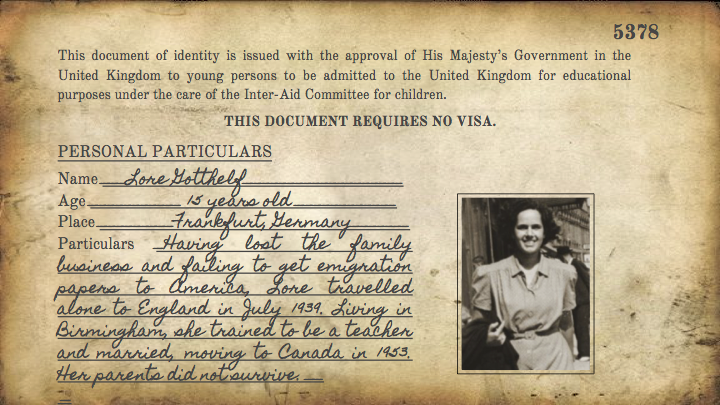 Aid agencies and popular opinion pressured the British government to accept Jewish refugees. 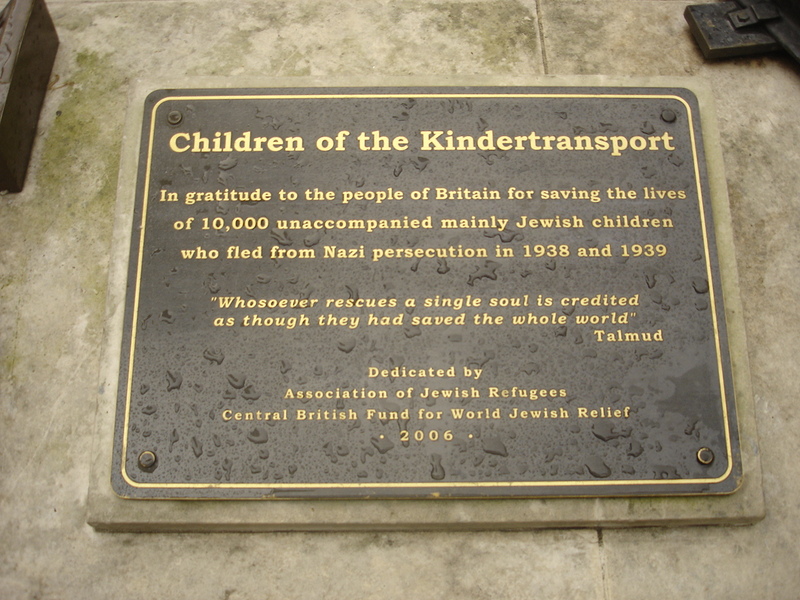 After allowing those under 17 years of age to enter, the Refugee Children’s Movement facilitated the movement of the children into England. The families of the children had to find a sponsor, have valid passports for them and provide £50 to finance their eventual repatriation. The resettlement was never intended to be permanent. Once the paperwork was in order, the children were sent on specially selected trains to ports in Northern Germany, Denmark, Holland and Belgium. 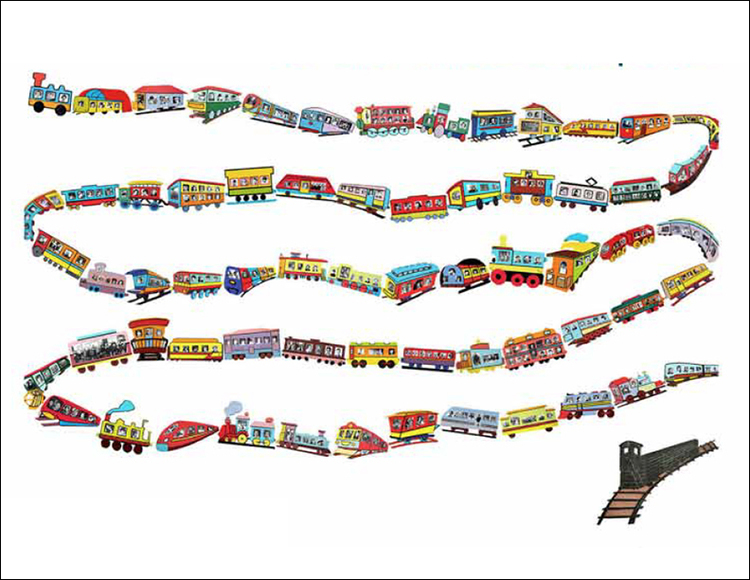 Once on board these trains the children were looked after by older siblings or members of Quaker, Christian and Jewish societies. Eventually the trains gave way to boats, and the children were placed in cabins for the short journey to England. After landing in Harwich, they were sent to London where they arrived at Liverpool Street station. It is indescribable what the families were feeling when they were preparing the children to leave home for an unknown destination. While many tried to be stoic and hide their sorrow, many did not. We cannot imagine making this choice, but there are many today who still do. Sadness, anger and confusion dominated the feelings of the children who were leaving their families behind. Most had never been away from home and had no idea why they were leaving. Some of these (in cases very young) children were on the trains alone, with no siblings, off to a foreign country with no idea of what might happen to them. Gender differences were quite pronounced in terms of how the children both responded and prepared for their new lives. Whilst boys tended to hold their emotions inside, the girls were devastated not only for themselves, but for their parents who were no doubt just as heartbroken to part with them. Crying, sobbing, and even screaming was very common for the girls, although each girl would have reacted to the situation in her own way. 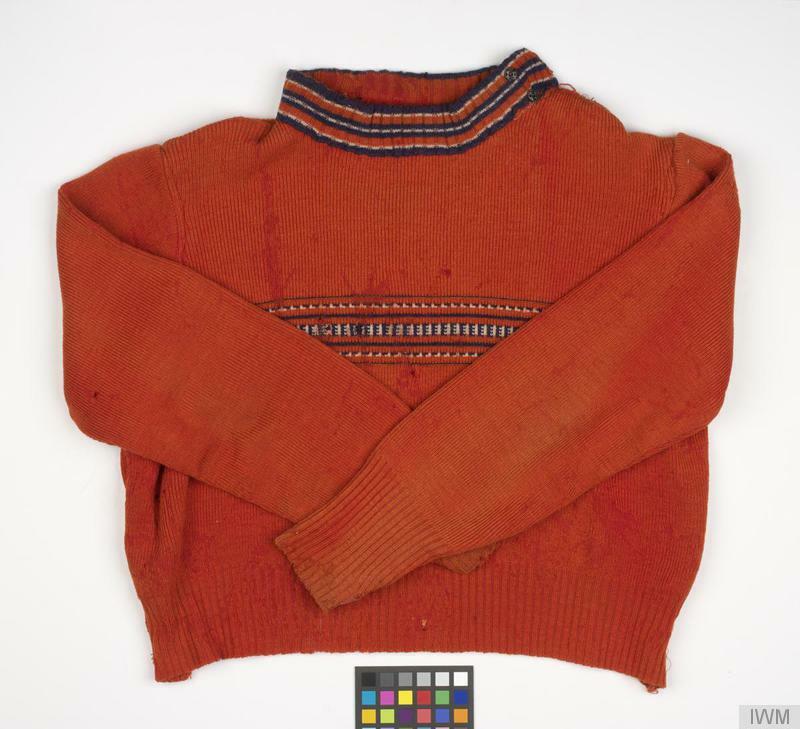 The children were also advised to bring warm clothing with them for the English climate, particularly warm underwear, coats and woollen items such as scarves, hats and gloves. 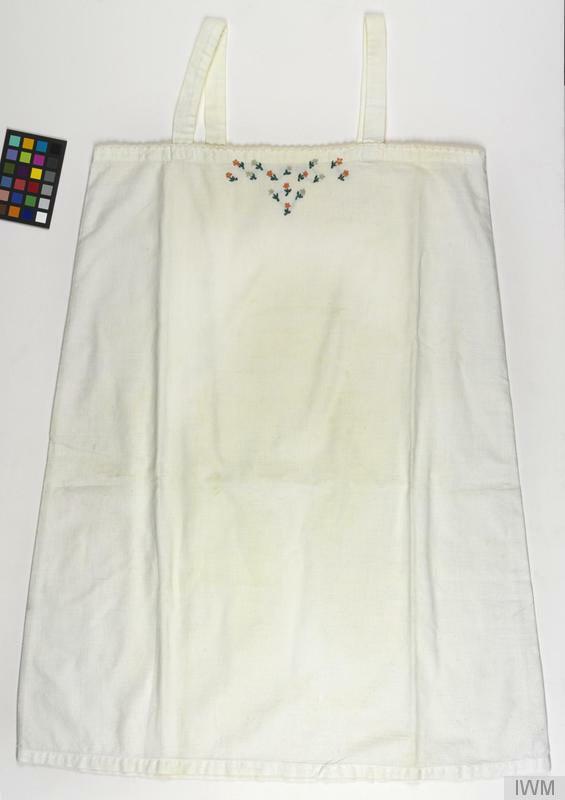 Many girls chose to bring items with personal meaning such as cherished toys, photographs, jewellery, and dolls to bring a sense of comfort and companionship on their journey and after they settled in England. 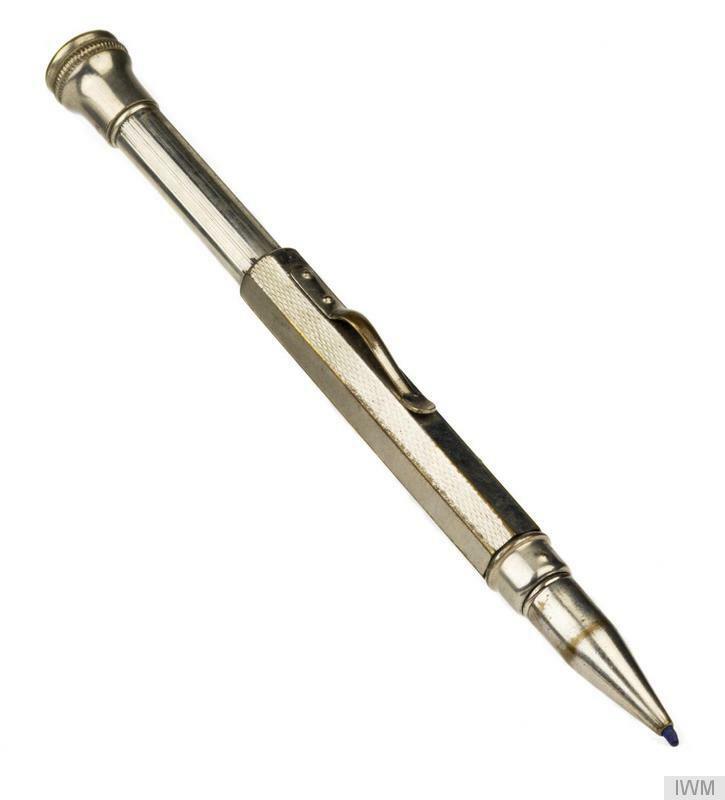 They brought these type of items with them so that they could remember their friends and family members. Today, the last day before you leave Germany, I am writing these few lines to you from me and from your dear father, to tell you that we want you to grow up to be a good person and to make your parents proud of you. May God protect you and watch after you, and bless your journey and arrival! Your ever-loving and caring mummy. “I lived through the next day as though in a trance – nothing seemed real any more. My case was packed, I said goodbye to my aunt and cousins and promised to write to them… When we arrived, there were already large numbers of children and their parents there. I was surprised to see, despite our strict orders not to be emotional, a mother and daughter with their arms round each other’s necks, both crying bitterly. But my mother and I kept to the rules: not a tear was shed. 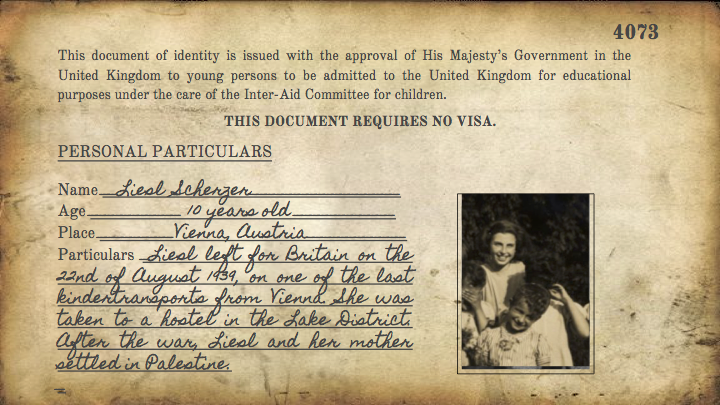 From ‘A Child Alone’, written by Martha Blend, 9 years old, Austria, Left for Britain in 1939. While on the train, most children made the best of a stressful situation. They tried to distract themselves, as well as comfort each other in the face of the unknown. 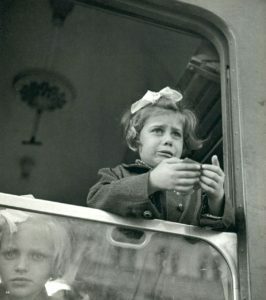 Many of the girls on the Kindertransports had mixed feelings about leaving their family and friends. Some girls were hopeful at the prospect of living in a new country, whilst others couldn’t bear to leave their families behind. This was coupled with the additional responsibility of looking after the younger children, which would have made the train journey quite nerve-wracking. Lisa Jura remembered being frustrated by a boy sitting next to her, excited to go to London and talking about how he would become a detective there. She just wanted to be alone with the thoughts of her family. 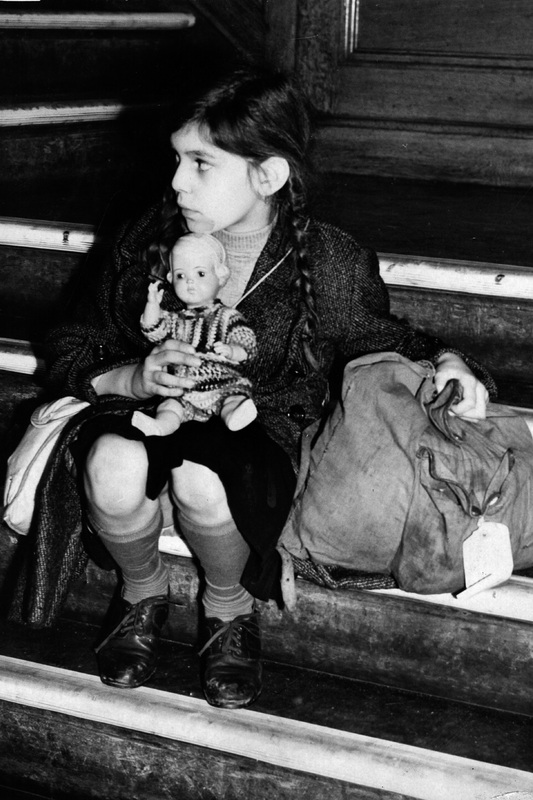 Girls of all ages carried dolls as a form of remembrance, comfort and stress relief. Many girls kept their dolls well into adulthood as a way to remember their former lives and to teach their own children and grandchildren about the life they left behind. 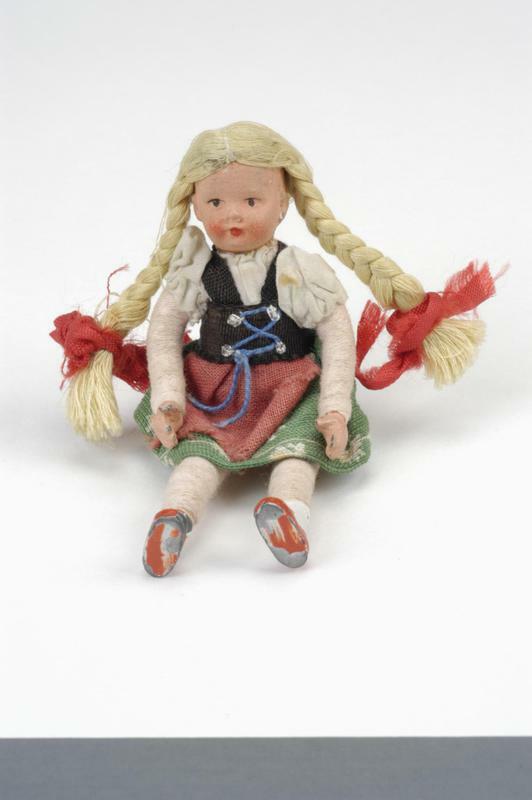 Milena Roth, who had carried a doll dressed in a Czech peasant outfit on her journey, only parted with her doll sixty years later. Vera Gissing did not want to forget the language of her homeland, Czechoslovakia (now the Czech Republic), but did not have any other Czechs to talk. She had long conversations with her doll in Czech, a way of remembering her native language. 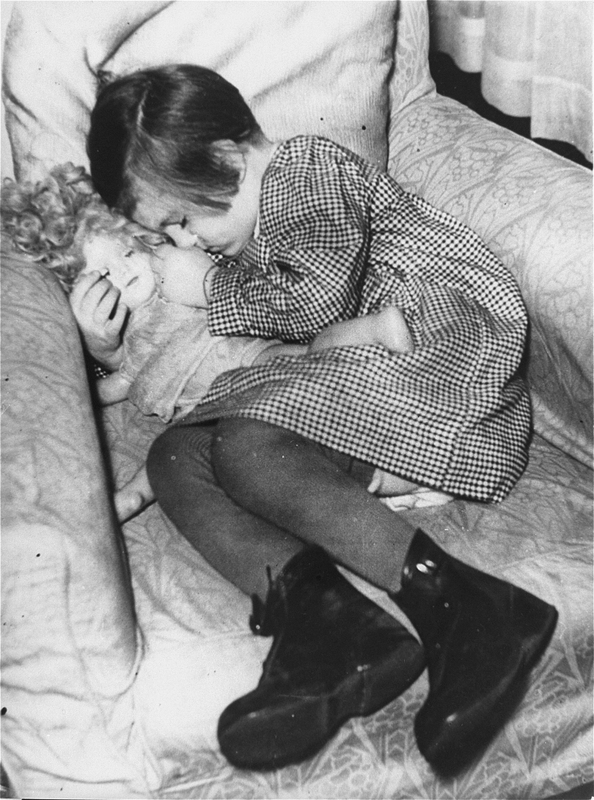 Her doll, as well as the Czech flag and a puppet from her teacher, gave her comfort whilst living in England. Vera would kiss the Czech flag, hug her doll and the puppet, and then pray. Many mothers and fathers begged their older daughters to look after their younger siblings or other young and unaccompanied children. The parents thought that the younger children would be a lot more scared leaving home than their older counterparts, hence the need for ‘Nannies’ on the trains. Girls were probably picked over boys to look after children, as at the time, the old adage of women and girls being naturally drawn to children meant that the parents thought that they would make better caregivers. “Girls are seen as more maternal, many kept up morale and even at this age recognized the need for cooperation and togetherness. Girls tended to band together to take care of infants who were often shoved on board in wicker baskets by their desperate mothers.’ -Dorit Bader Whiteman. The strict regulations on what could be taken with them on the journey made it hard to bring many comforts from home. But the children managed. Here are some of the objects girls’ brought from home. 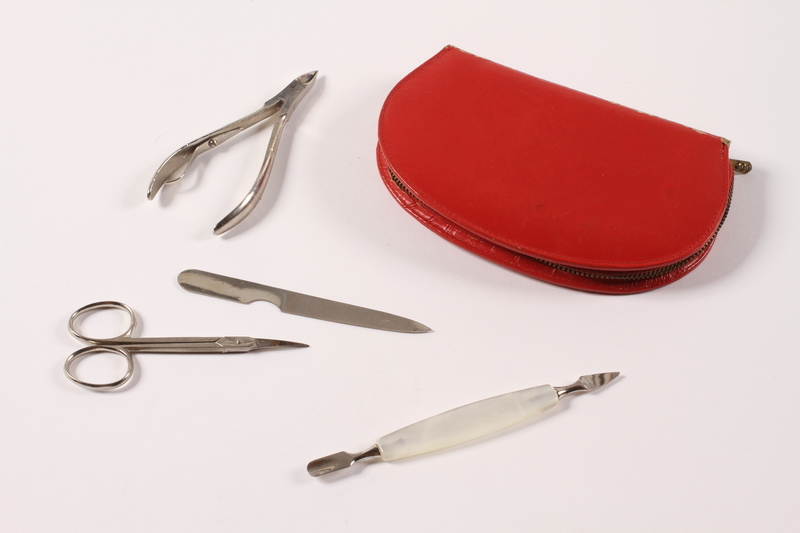 Cuticle cutters and pusher, a nail file, and manicure scissors in a fitted red leather case brought by 14 year old Gisela Marx on a Kindertransport from Dulken, Germany, to Great Britain in August 1939. 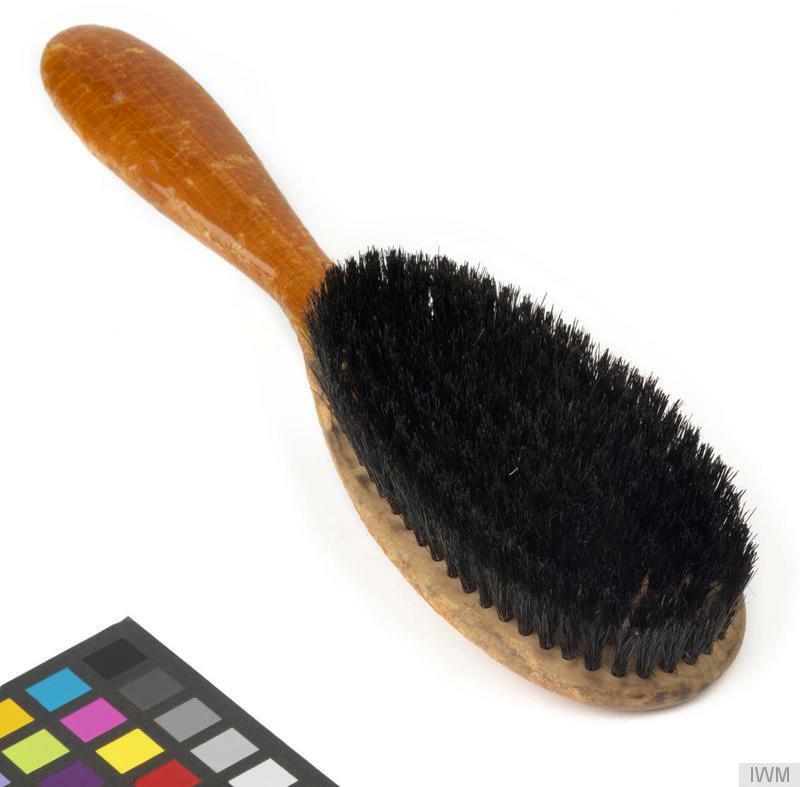 Her parents Erna and Leopold purchased the manicure set for her to take on her journey. Reddish-gold chain with a medallion, in a photograph. 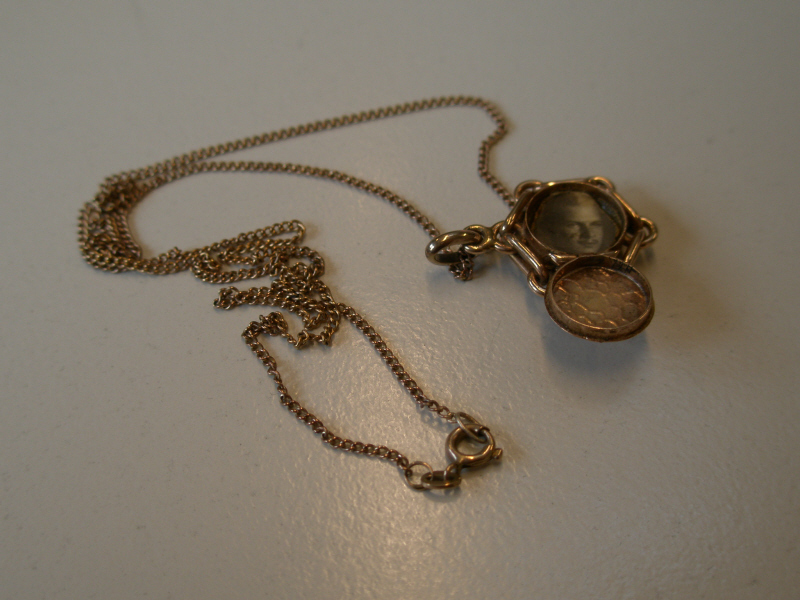 The medallion has a hexagonal shape. Photography fragment showing a man with a mustache in half-profile facing to the right. The man’s identity is unknown. 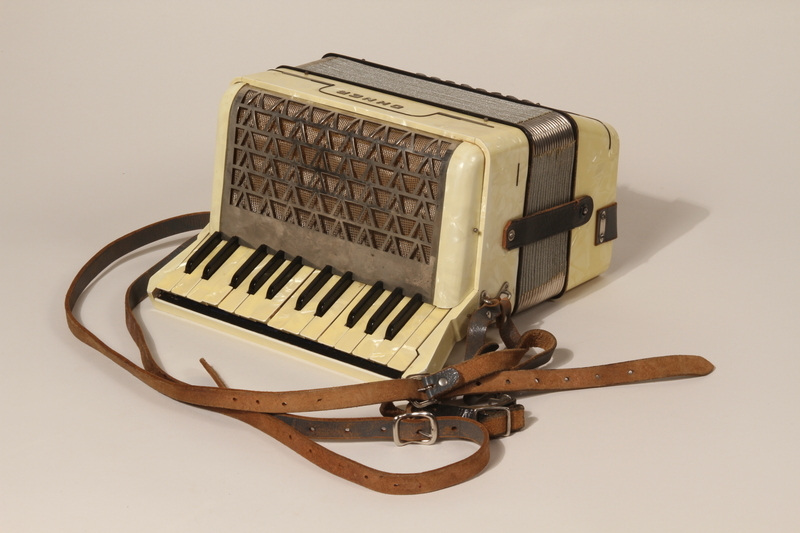 Imperial IIA small piano accordion and case belonging to Hilde Anker, 13, who took it with her on a Kindertransport from Berlin to Great Britain on June 12-14, 1939. 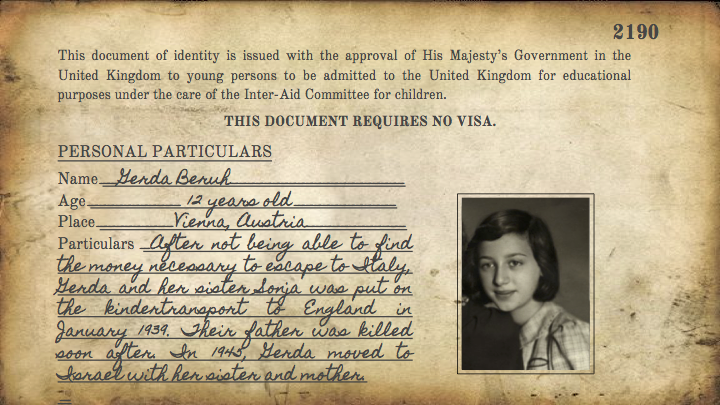 Hilde’s sisters, Eva, 17, and Dodi, 15, were also sent away by their parents on the same Children’s Transport. Their uncle, Leo, in England agreed to look after them. 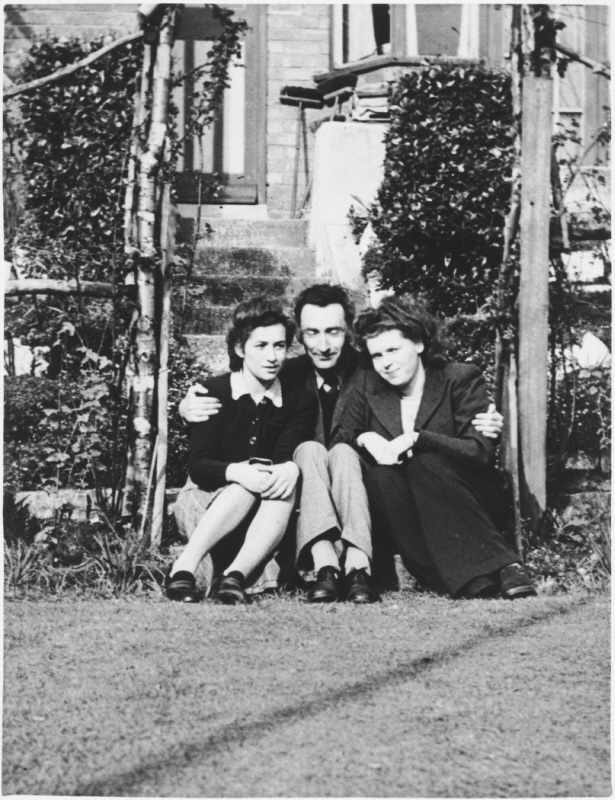 Eva was sent to a vicarage in Sussex, and her sisters later joined her due to the constant bombing during the Blitz. Upon arrival, all the children received medical examinations and then put on trains to London. They would have been nervous, excited and terrified at the prospect of a new life in England. Some children left to live with relatives already in England, whilst others went to live with foster families already arranged before their arrival. In order to ease their fears, some kind Londoners took children to the cinema and gave them treats as they waited to be collected by their foster families. For a large majority of children, they lived in group homes with other Kindertransport children until well after the end of WWII in 1945. 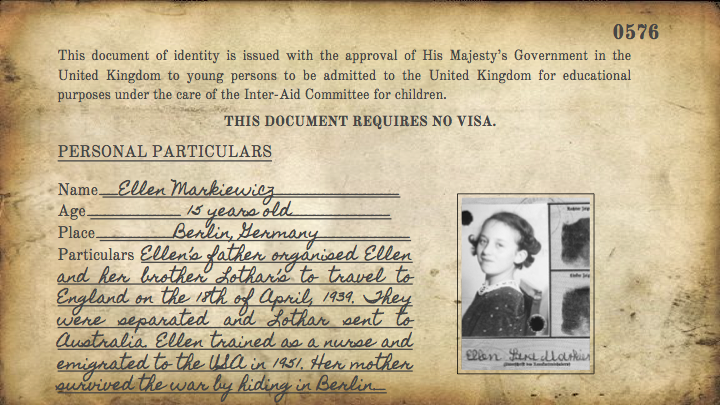 Alice Eberstarkova left Czechoslovakia in 1939 with her two sisters, Josie and Ellie. 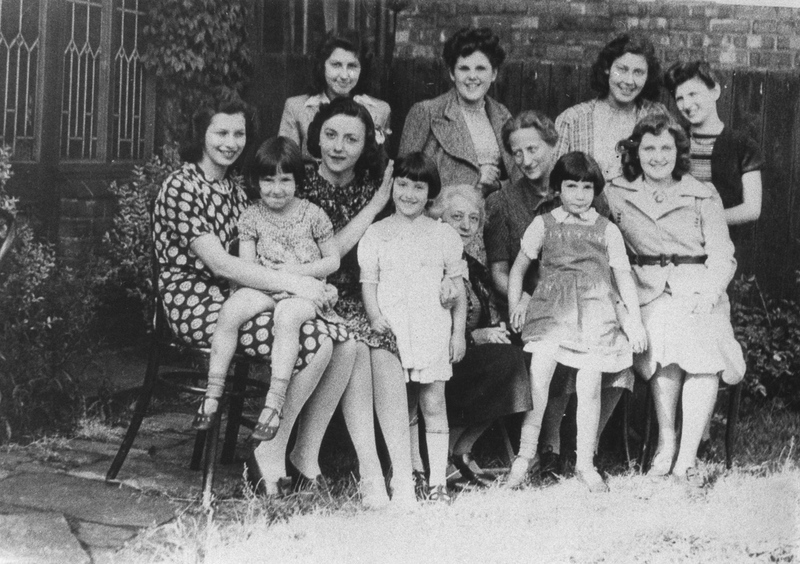 After their arrival in England, Alice and her sisters were expecting to be placed with a family, organised by their Uncle who lived in England. However, when they arrived they were told that they would live in a children’s home in the south of England. While the children’s home was a beautiful old house, Alice and her sisters found this betrayal very painful. 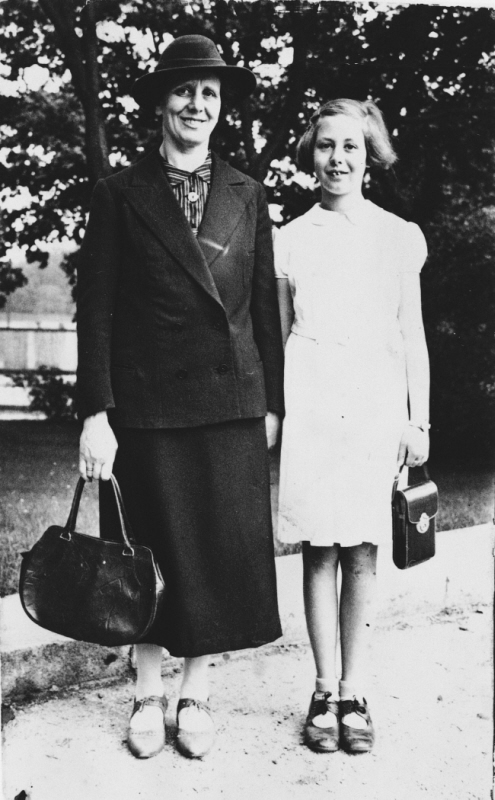 Dec. 2, 1938 Josepha Salmon, 8, arrives at Harwich on her way to the Dovercourt holiday camp. 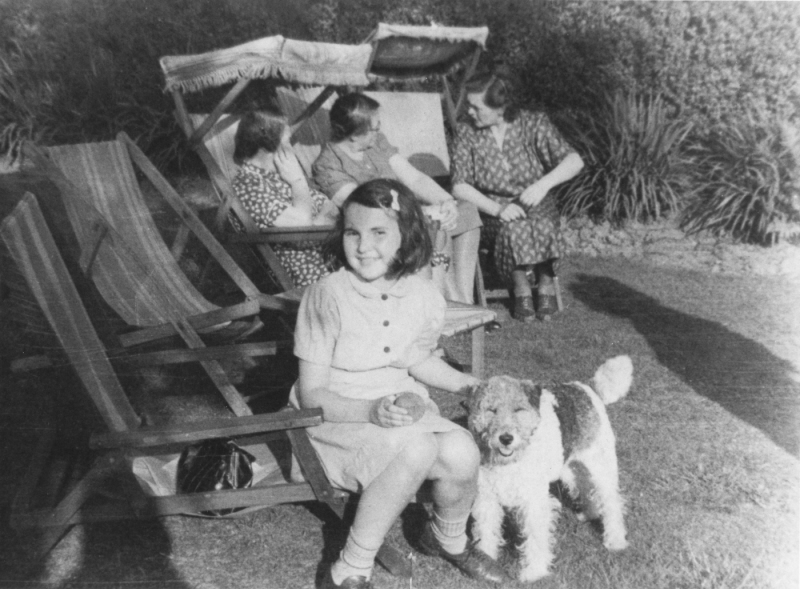 Many Kindertransport children lived in holiday camps converted to house children, including one at the Essex seaside village of Dovercourt and the Suffolk village of Pakefield. 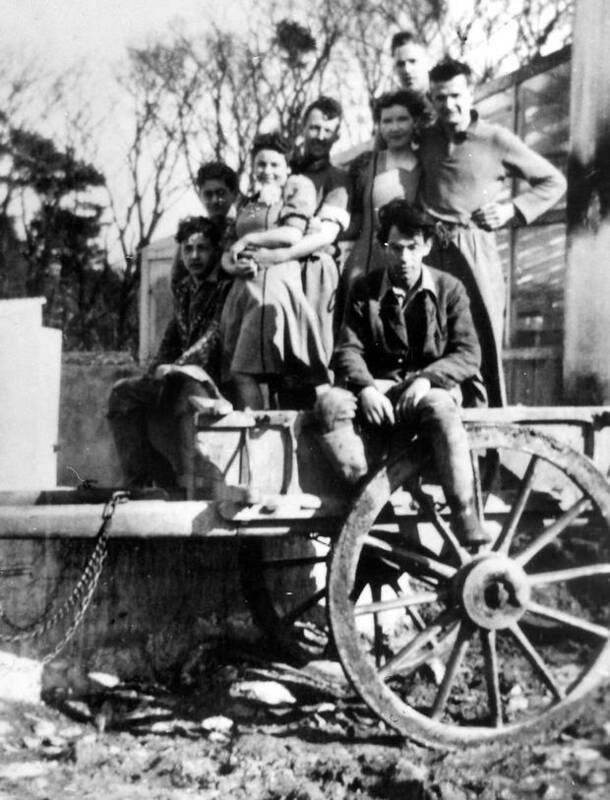 A Jewish youth movement, called Habonim, were responsible for running several hostels for Kindertransport children in the South-West England, mainly in the Dawlish and Exmouth areas. ‘Whether living with relatives of well-meaning strangers, boys and girls adapted to their new lives and new families differently. Evidence strongly suggests that boys adjusted better and quicker to their new surroundings than girls did’. Finding comfort and safety in their new environment, with strangers as family, was an enormous task for these young people. There were no guarantees in this world, they had learned that already. 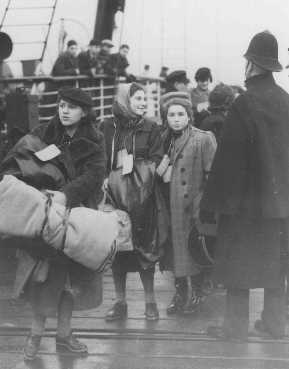 Many children tried to get their parents and other family members out of mainland Europe before the outbreak of WWII in 1939. However, most did not succeed and only learnt about the fate of their families after the end of the war. Lore Segal remembered, ‘I think I had a sense that when I was lying in bed I was wasting time, that while I was playing for instance, or while I was laughing, that might be the moment in which I could have hand should have been doing something about demand on me that I should bring my parents out’. 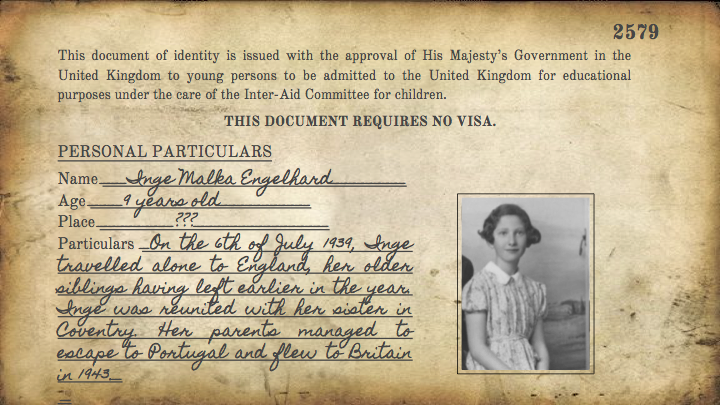 Lore found it hard in the United Kingdom without her parents, and tried to rescue her parents. Whilst Lore’s time in Britain may have been a relatively happy one, this was not always the case. Many girls, especially younger ones, found it difficult to make it on their own because of the loss of their parents. 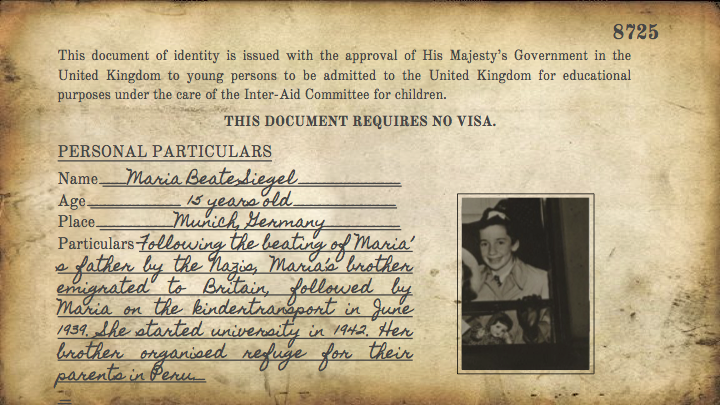 Many of the Kindertransport children and their adoptive families kept Jewish traditions alive throughout their stay in the United Kingdom. This included observing Jewish New Year (Rosh Hashanah), Hanukkah and Passover. For Christian families that took in Jewish children, it simply meant they did not serve pork to the children and let them observe their holy day on Saturday. Yet many adoptive families willingly ignored Jewish traditions, either on purpose or because of ignorance. Some even baptised younger children and changed their names to Christian names, in order to make them forget their Jewish heritage. Not all children enjoyed their new life in England. Some struggled with the adjustment to a new family and a new way of life, while others tried to keep some of their own traditions alive in England. A girl’s likelihood to continue her schooling was dependent upon the home in which she found herself. Arranging fostering with family members was not a foolproof way of making sure that your child would continue in her education. 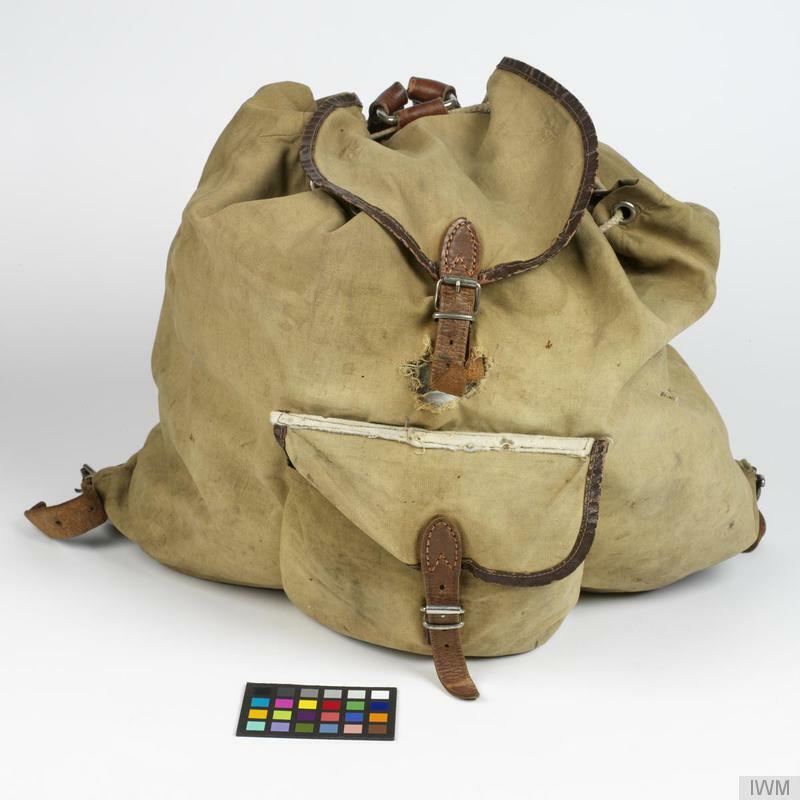 Some girls were actually used as unpaid house servants, particularly during wartime, as many English citizens were engaged in war duty. The war had also made staff much harder to find. 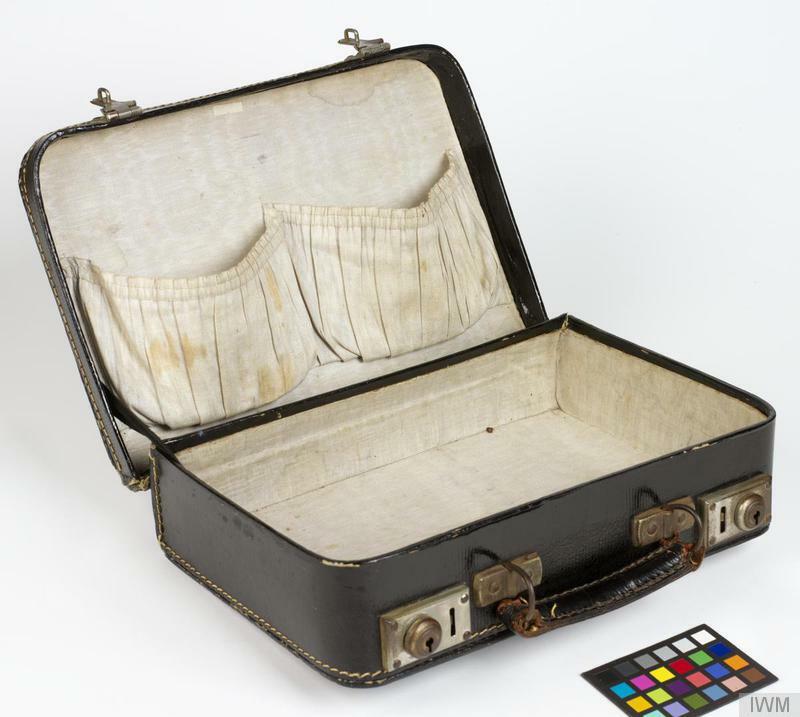 This was one way for girls too old for kindertransport and mothers to get to England and find their daughters/younger sisters.Typically girls were sent into work rather than school in order to contribute to the household income. The girls who stayed at Harris House undertook training and education to better prepare them for life after school. Many girls had received an excellent education in their home countries and therefore expected to go on to university. 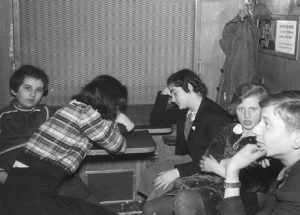 Teenage girls who did not want to go to university in Harris House took up posts as apprentices in tailoring, hairdressing, dressmaking, salesmanship, chemists assistant and dispensing. Throughout their time in England, many children found it easier to be among refugees, because it helped ease their fears and made life endurable. ‘We were all more or less on an equal footing, all refugees, all in the same boat, and we took care of each other. The knowledge that we were not alone in our experience, that we mattered to someone else, was a part of our healing.’ – Frieda Korokbin. Many children would have felt this way. Harris House was a home for girls from the Kindertransport at 27 Argyle Road in Southport. Opened in 1939 by the Livingstone Family, the house was consecrated by Rabbi Dr. Silverstone as a hostel ‘for young ladies up to eighteen years of age.’ The Rabbi was a close friend of the girls, and Judaism maintained an important aspect of the houses and of the girl’s identity. Many homes like Harris for refugee children opened during WWII, as Britain became increasingly aware of the danger Jewish children faced in their home countries. 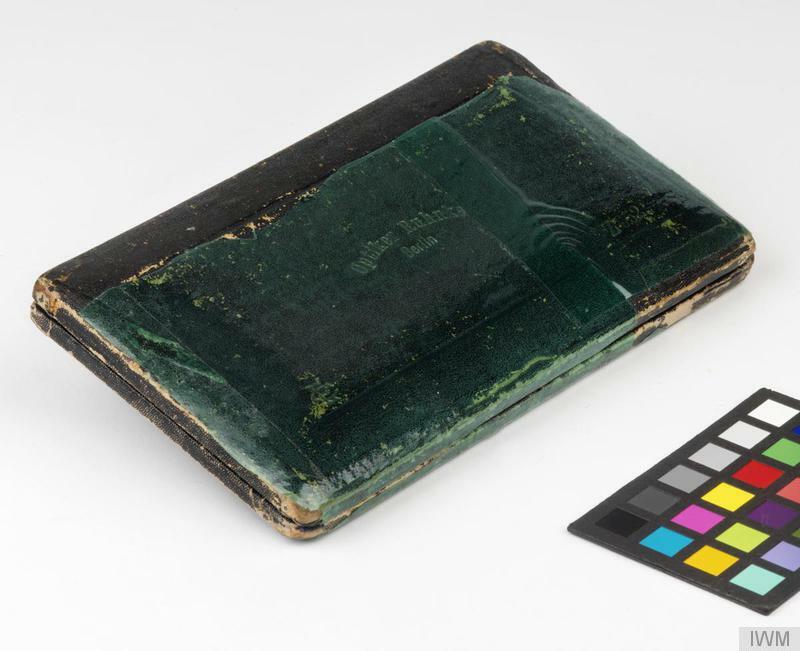 What was unique, however, was the Harris House diary. 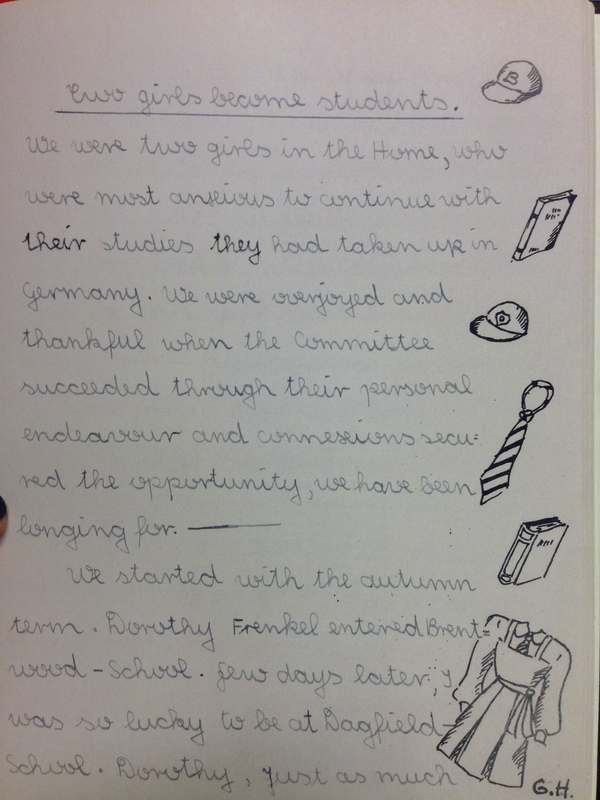 The girls who stayed at Harris House made a diary together to journal their experience. 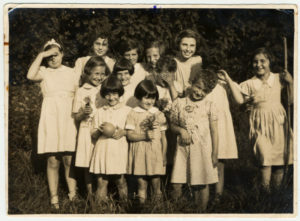 Dorothya Frankel, Charlotte Gross, Jutta Shulz, Gerta Herzberg, Helga Liebeman, Eva Riese, Frieda Beer, Ilse Maurer, Margot Brauer, Kitty Pistol, Gina (Jean) Bauer, Hedwig Herzberg, Jill Mark, and Clare Srehaping all wrote passages in the diary introducing themselves and where they had fled from. What is noteworthy is how “normal” the girls sound in their diary entries. The girls often pay more attention to typical girl problems than of the wider problems of the war. For example, school, family, fun with friends and admiration for peers are the most talked about topics throughout their entries. “We like our lessons very much and we are very fond of games, which are quite new for us,” one of the girls wrote. However, the success of Harris House was short lived, as the house closed in June 1940. With only twenty four hours notice, and on demand of the local police, the committee dissolved the hostel and the girls were scattered to towns across England. A small minority of children travelled on to Northern Ireland to live and work at a farm in the County Down countryside. This farm was situated between the small fishing villages of Donaghadee and Millisle on the east coast of Northern Ireland. Originally, the farm had been set up to teach young Jewish people how to farm so that they could immigrate and set up their own farms in other parts of the world. However, after Kristallnacht in 1938, it became clear that the farm would be used to host Jewish children. Many Jewish children travelled across Europe with ‘Donaghadee, Northern Ireland’ written on luggage labels around their necks. A lot of these children had never heard of Northern Ireland and did not know what to expect on arrival at the farm. Upon arrival, the children were placed in local schools to learn English and to begin an Irish education of history, science, Irish language and traditional sports such as Gaelic and Hurling. This was coupled with working on the farm to produce milk, bread, meat and eggs that were eventually sold to fund the children’s upkeep. The Jewish children were embraced by the population of Millisle and Donaghadee, and many opted to stay in Northern Ireland after the end of the war. 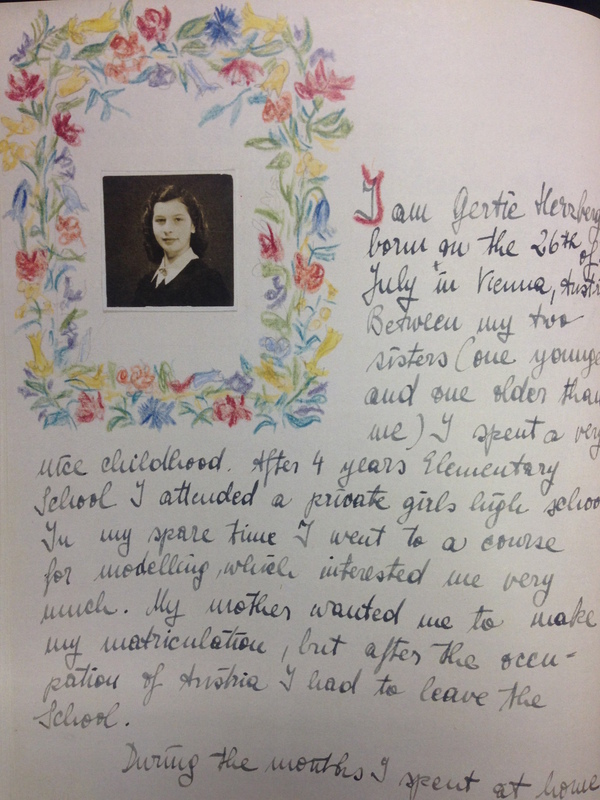 For many girls, they had high hopes of reuniting with their families back home after the war. Girls appeared on the whole to be less satisfied and happy with their later lives and often felt themselves disadvantaged in terms of careers. 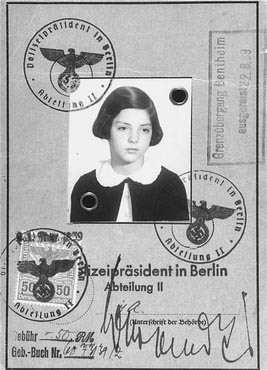 Some girls took jobs or developed societies that dealt with issues of relocation, the Holocaust, and refugees – dedicating their lives to educating and helping people. Others joined the armed forces. Youth hostels and associations developed to support the influx of Jewish refugees. These were great places to meet people that had common backgrounds in terms of country of origin, religion, war time experience, and language. Some women met their husbands in these situations. Lore Gotthelf walking down a street in Birmingham. (Credit: United States Holocaust Memorial Museum, courtesy of Lore Gotthelf Jacobs. Lore Jacobs (born Lore Gotthelf) is the daughter of Gertrud and Sigmund Gotthelf. She was born April 17, 1924 in Frankfurt am Main, where her father was a distributor of ladies hats. Lore attended the Holzhausen Schule from 1931-1935, where the majority of the students were Christian. When Jews were forbidden to attend German schools, she was enrolled at the Philanthropin, a Jewish elementary and high school in Frankfurt. On Kristallnacht her father was arrested and taken to Dachau where he remained for three weeks. He returned in very poor condition. When the Nazis took over the family business, the Gotthelfs was forced to live off their savings, which was also later confiscated. The family had applied to emigrate to the United States, but their application numbers were high and the wait was long. They therefore registered Lore for a Kindertransport to England. 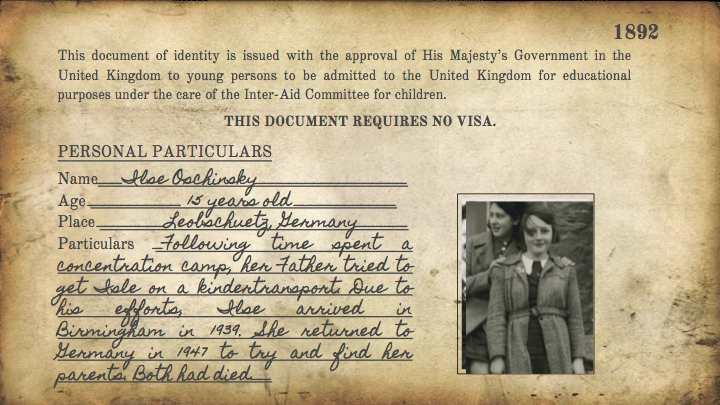 She was accepted and left Germany on July 7, 1939. Her sponsors were the Quakers of Northampton, England. She lived with the Barnes family for 6-7 months until the area was militarized and people of German birth could no longer live there. Lore was then sent to live with a family in a farming village. When she was 16 she moved to Birmingham, where she took a course in nursery school education. 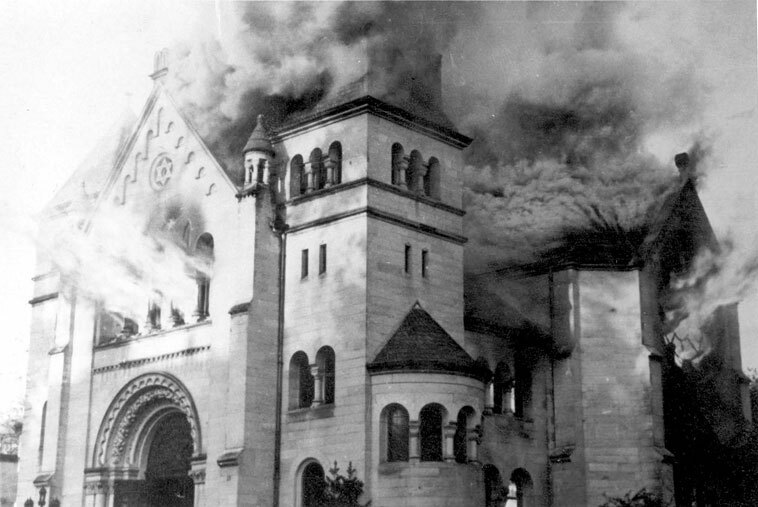 Lore met her future husband, Erwin Jacobowitz, at the Singers Hill Synagogue Refugee Club. Their wedding at the Buckland Crescent synagogue in London was conducted by the rabbi of Lore’s former synagogue in Frankfurt am Main. The couple changed their name to Jacobs. They remained in Britain until 1953 when they emigrated to Canada. 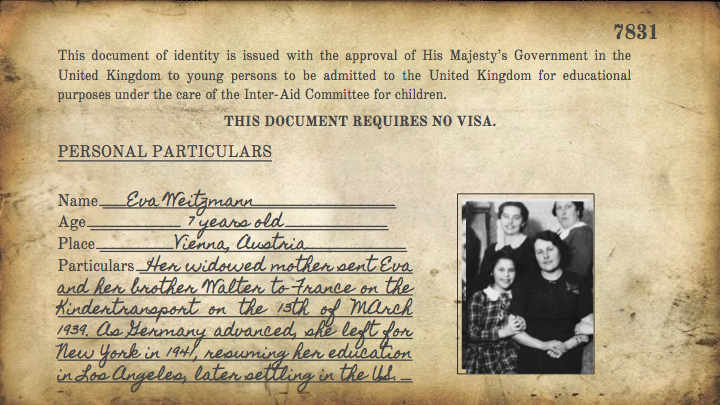 Lore’s parents were deported to Lodz on October 19, 1941, where they perished. Her half sister, Friedel (b. 1910), emigrated to the United States. Mimi Ormond (born Mimi Alice Schleissner) was born on January 28, 1926 in Marienbad (Marianske Lazne), in the Sudetenland region of Czechoslovakia. 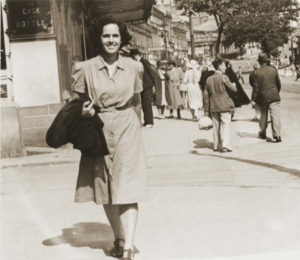 She had one older brother, Edward, After the German annexation of the area in September 1938, the Schleissner family left their hometown and moved to a small room in Kolin nad Labem. 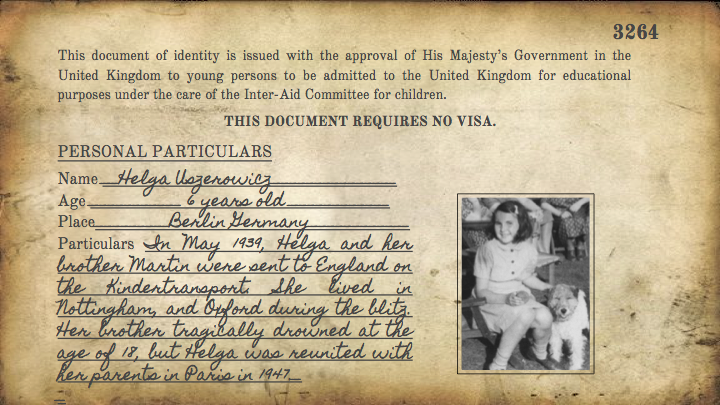 They started to make efforts to leave Czechoslovakia and obtained various visas for different destinations. However, before they succeeded in emigration, in March 1939 Germany invaded Czechoslovakia and created a German Protectorate of Bohemia and Moravia. 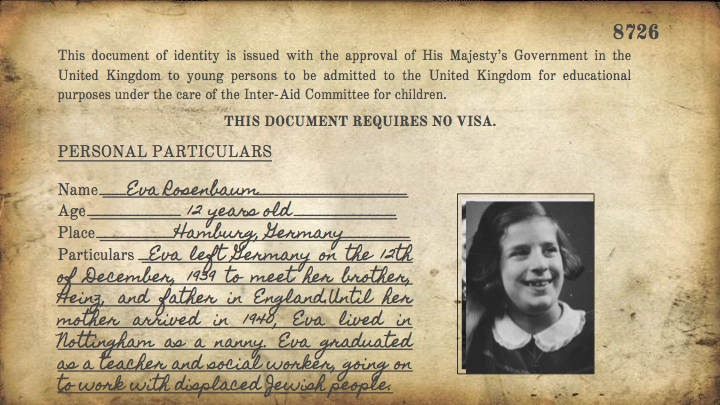 In May 1939 Mimi, who was thirteen years old was accepted on a Kindertransport, a rescue effort, which brought thousands of Jewish refugee children from Nazi occupied Europe to Great Britain. Edi was not able to leave, since he was eighteen years old. Mimi joined a Zionist youth group to prepare her for agricultural settlement in Palestine. She planned to stay in England for just a few months, but Germany’s invasion of Poland on September 1, 1939 and the start of World War II caused her to remain in Britain till the end of the war. In December 1939 Mimi’s parents and brother managed to illegally leave Czechoslovakia and reached Palestine in January 1940. Mimi in the meantime joined another Hachshara, at first in Great Engham Farm in Kent and later in Landough Castle near Cardiff in North Wales. This group was bombed out and she went on to join another group in Gwrych Castle near Abergelee in North Wales and finally left for Bydown Castle near Barnstaple in Devonshire. In 1942 Mimi left the agricultural training program, and moved in with her aunt and uncle in Cheltenham where she was tutored in English by a refugee professor. He told her that she could attend college for free if she wanted to train to become a nursery teacher. After two years of study, she became a head nurse in a day-care center and entered a life-long career in early childhood education. 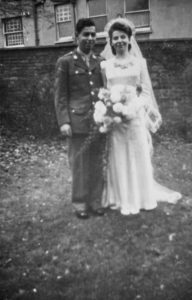 Mimi Schleissner met a U.S. soldier and violinist, Edward Ormond; they married on November 8, 1944. Before settling in the United States, Mimi traveled to Palestine to visit her parents and brother. After the reunion with her immediate family, she traveled to Alexandria, Egypt and sailed to the US on board of SS Thomas Barry. Credit: United States Holocaust Memorial Museum, courtesy of Ruth Hilde Terner. Ruth Terner (born Ruth Cohn) is the daughter of Werner and Frieda (Friedl) Cohn. She was born in 1923 in Berlin, where her father and uncle manufactured summer hats and doll clothes. Her older sister Steffi was born in 1921. Her father’s family had lived in Berlin for generations, and her mother’s family came from Soldin, near Poznan. In 1939 Werner and Frieda decided to send their daughters to England on a Kindertransport with the hope that they eventually would join them. Steffi left first since she just barely squeezed by under the upper age limit of 18. Ruth left on the next to the last transport on August 10, 1939. 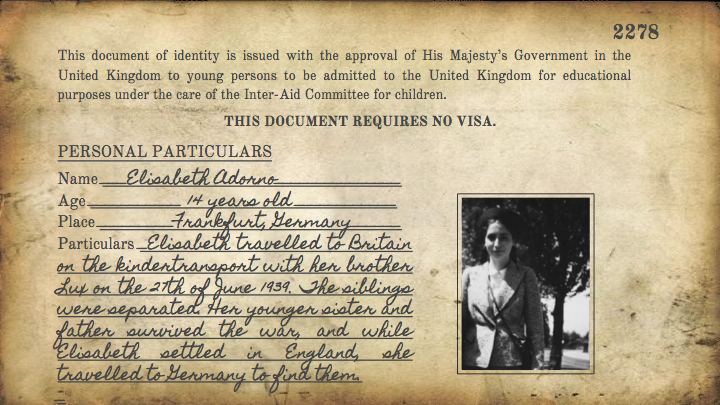 Her sponsor was Frau Landsmann, a non-Jewish German woman who together with Mrs. Atkinson of Dorset, helped many Jewish children to find refuge. 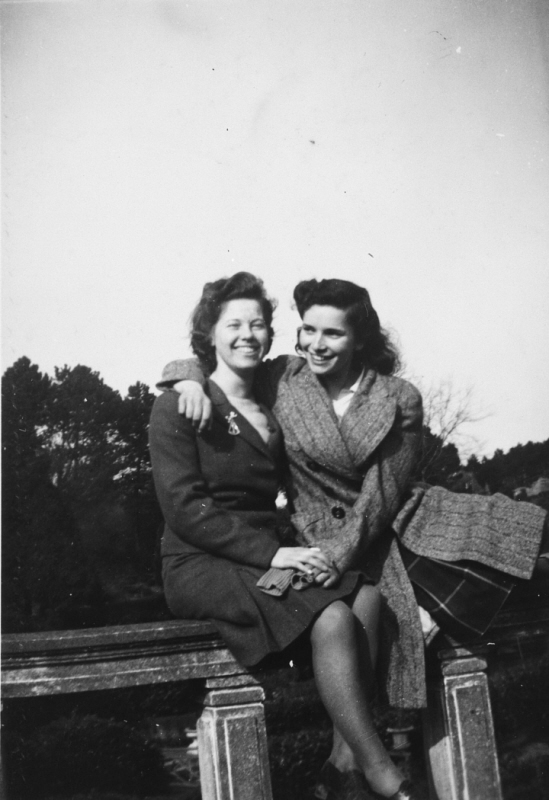 After Ruth’s arrival in England, Mrs. Atkinson, now Ruth’s guarantor, sent her to a small town in Buxted Sussex to train for a career in nursing. She first was given the position of a trainee to a matron in a boarding school. 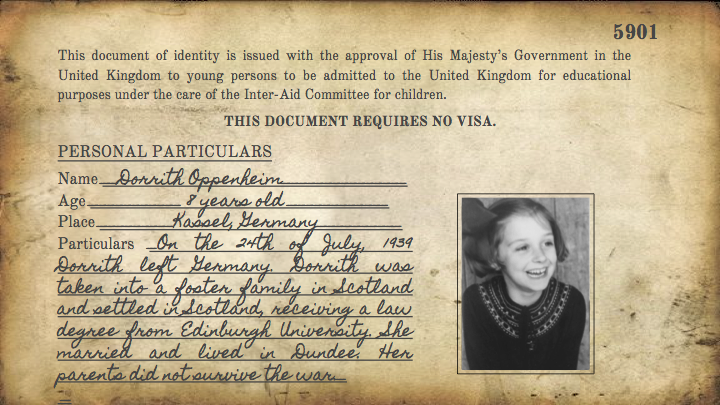 Ruth was very unhappy there and eventually moved to a different school in Warminster, Wiltshire, where there were other refugee children. After Ruth became ill, she had to move to a still a new position. Since her sister was then in Birmingham, Mrs. Atkinson found her work nearby assisting mentally handicapped children. 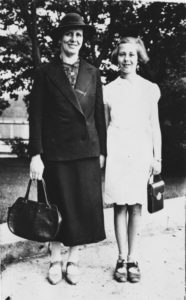 Ruth eventually convinced Mrs. Atkinson that she had no interest in that type of work, and following a two-week vacation in Dorset at Mrs. Atkinson’s home and farm, Ruth went to work for the war effort. While in Birmingham, Ruth met Karl (later Charles) Terner, a chemist and Jewish emigre from Vienna. They married in the Central Synagogue of Birmingham in 1945 and immigrated to the United States ten years later. 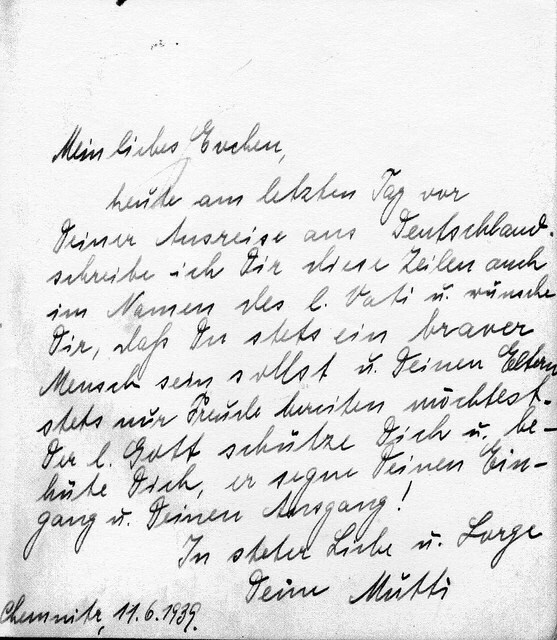 While in England, Ruth and Steffi regularly corresponded with their parents up until 1940 or 1941. After that point they only could receive short messages through the Red Cross. In the spring of 1942, Ruth’s parents were deported from Berlin to Treblinka where they perished. In July 1942 her grandmother, Olga Cohn, wrote to another son living in India telling him that she was about to travel, a euphemism for deportation. She also perished. Another uncle, aunt and cousin of Ruth met the same fate in 1943. Watch these amazing women tell the stories from their girlhood experiences in the Kindertransport. Art therapy is recognized as a powerful tool in processes of healing after traumatic experiences. As trauma is stored as a memory, as an image or a series of images, ‘expressive art processes provide an effective method for processing and resolving it’. 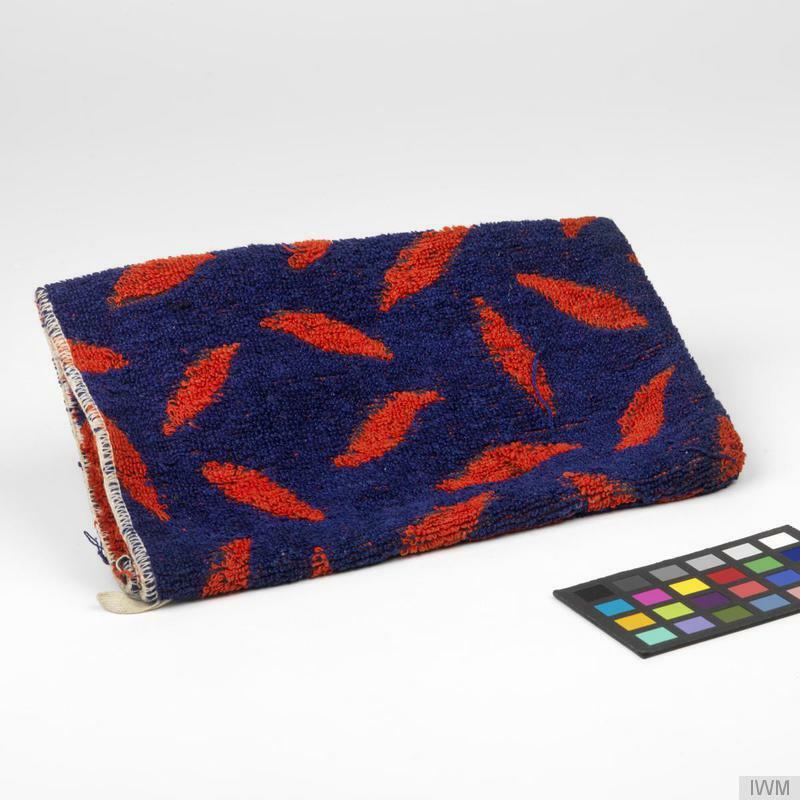 Art as a way to express and to explore feelings and experiences was the way some of the Kindertransport survivors attempted to understand and communicate what happened to them and how they felt. While she was not part of the Kindertransport, artist Gabriella Karin was persecuted as a young Jewish girl during WWII in the Slovak Republic, hidden from the Nazis in a convent and by non-Jewish friends. Gabriella created ceramic sculptures in tribute to the children of the Kindertransport. Michele Gold was so inspired by Gabriella’s work that she wrote a book about the children who were saved by the Kindertransport. This book is called ‘Memories That Won’t Go Away’ and gathers together the stories of the rescued children. 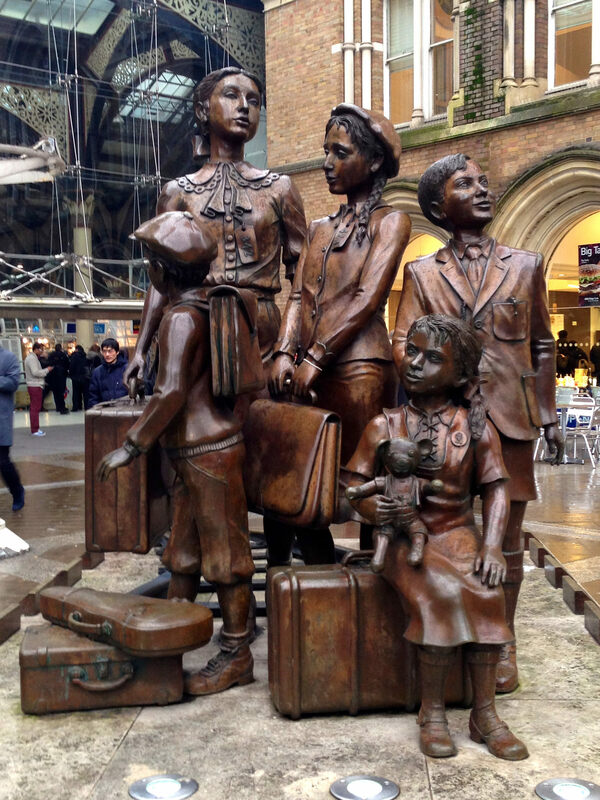 Michele asked Gabriella to provide the illustrations for the book, adding photographs of Kindertransport children to the ceramic windows of her sculpture. Train sculpture by Gabriella Karin. Like our heroine quilts, Kindertransport survivors have created a series of quilts that trace the history of the Kindertransport from 1938 to the present day. These quilt panels were made by members of the Kindertransport association in the USA, and were designed for exhibition in Holocaust Museums and Study Centre, Jewish community centres and universities. The quilt offered multiple artists the opportunity to express their view of the Kindertransport experience, united through common events and feelings. As a communal activity, making a memory quilt brings together those who experienced the Kindertransport and offering them a means through which to consider and express their thoughts as both individuals and as part of an event which touched many people and continues to affect many more through the generations. And emblem of such histories. Or dumped in a museum as showpiece of luck. 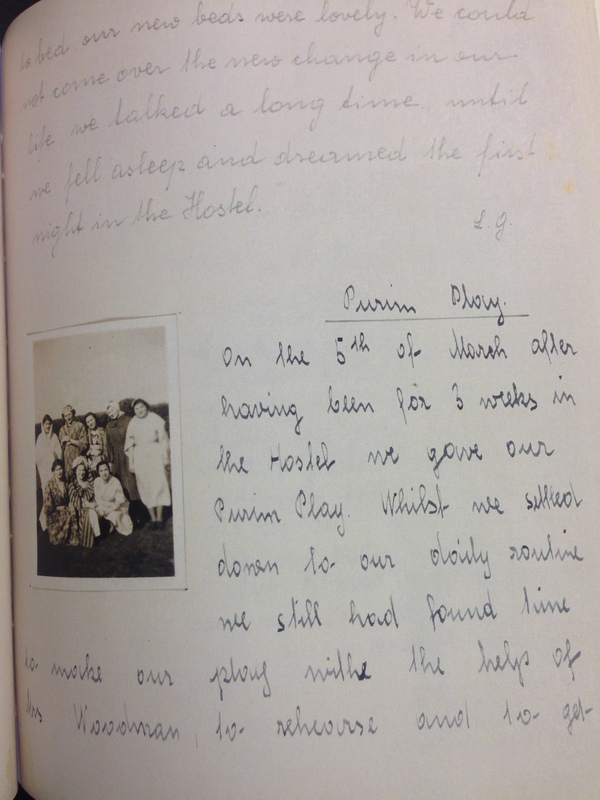 Autobiographical books, such as By the Moon and the Stars by Eva Hayman, often use the diary entries of young girls during their time in new and sometimes strange places. 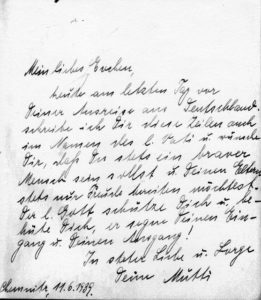 Eva kept a diary of events, not only of the war within which she found herself, but of a young woman coming to terms with separation from her family and the threat of the Nazi regime on those she had left behind. 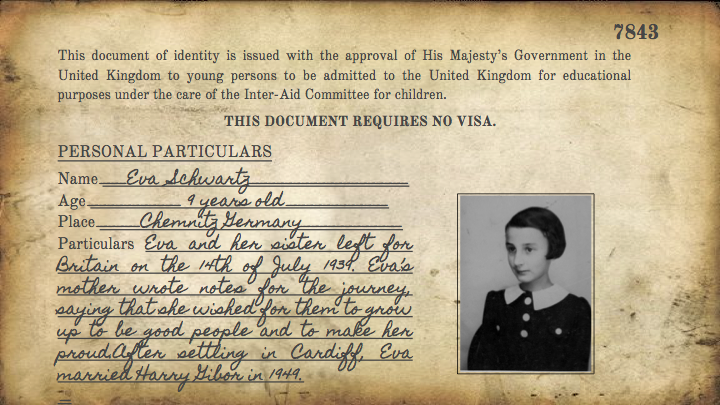 Many decades after her experiences of the Kindertransport and writing those diary entries, Eva published her thoughts as a book for young people. This and other books based upon first hand experience can be found here. There were eight ‘trips of mercy’ in total. They began in November 1937 as the first rescue effort to be aimed at children. It wasn’t until after 1945 and the horrors of the concentration camps were discovered that those who saved the children realized they had saved those children’s lives. Yet many countries refused these children, including the United States. 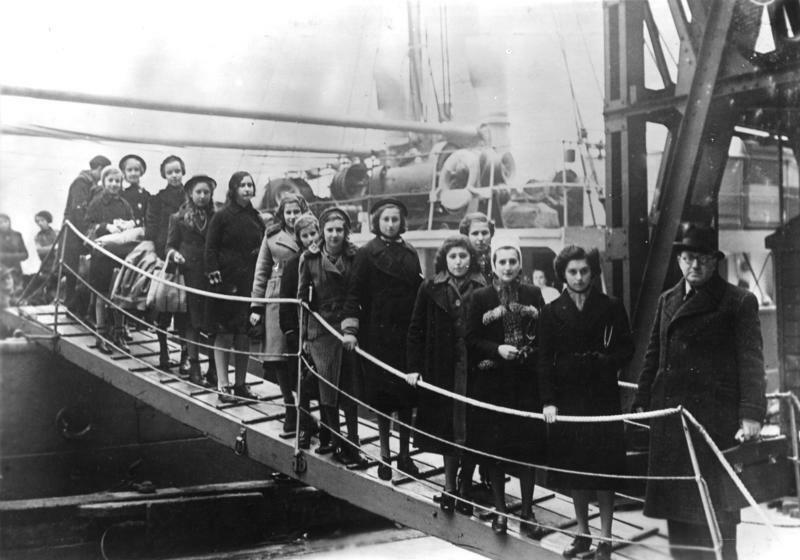 It was much later that the USA accepted Jewish refugees from Europe. A consequence of its isolationist policies, fear, and desire to stay out of European wars kept the US from aiding in one of the greatest humanitarian crises the world has ever seen. Has anything changed? There are so many horrible and tragic situations in the world today, and children bear the brunt and burden of them. Will Kindertransports happen again? They are already happening, but still countries refuse these children. In the Internet age, we have more power than ever to help our fellow humans. Yet fear dominates public sentiment and policy decisions. We forget what time has not—that by opening our borders and hearts, we can stop the spread of hate. We can save innocent lives and change the future. Liverpool Street Station Memorial Plaque. The ‘Trains to Life’ memorial stands outside Liverpool Street Station in London. 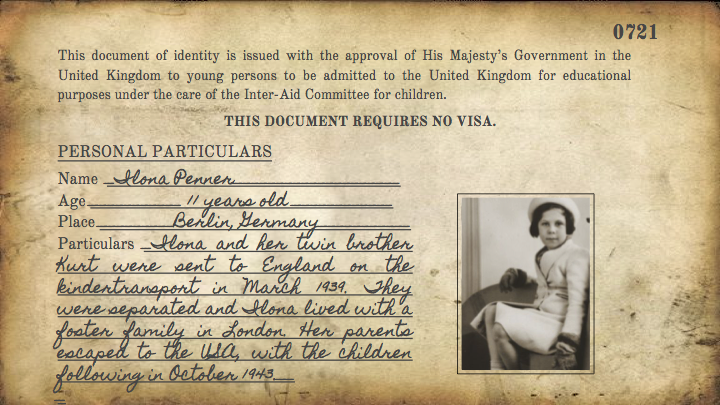 It remembers the facts that 10,000 Jewish children were able to leave Berlin for England by train before the start of WWII. The sculpture was created by Israeli sculptor Frank Meisler, who was among those saved. A corresponding memorial is located at Friedrichstrasse station in Berlin. 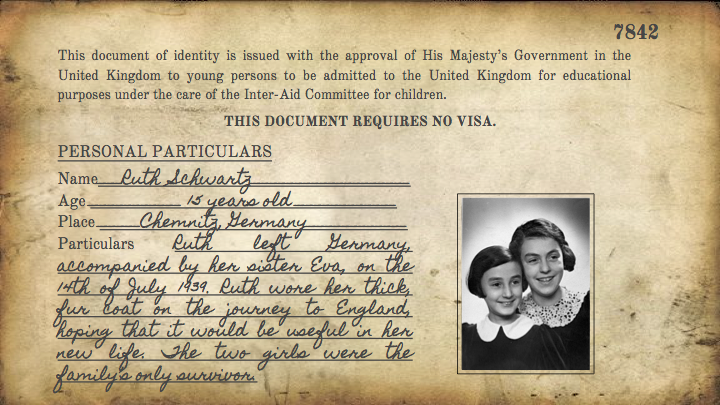 Download our Kindertransport Educational Guide for fun activities to test and expand on what you’ve learned in our exhibit. Designed for classroom or home use, this guide is aligned to US Common Core State Standards. The curatorial team for this exhibition is Ashley E. Remer, Sarah Raine, Rachel Sayers, Chloe Simm, Chloe Turner, Mary Horrell, Tiffany Rhoades, & Emma Brynning. Special thank to Kelsey Rosborough for creating the original exhibition and to Miriam Forman-Brunell for bringing it to us. All photos and videos in this exhibit are used under (1) Creative Commons licensing, (2) Fair Use terms of U.S. Copyright law, or (3) with the express permission of the author.